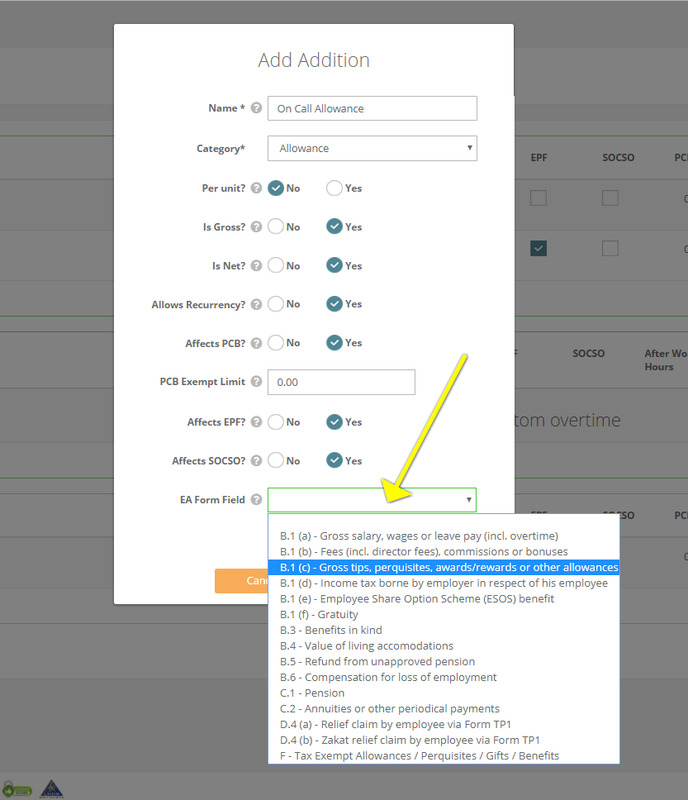 PayrollPanda — How to include custom payroll items correctly in the year end forms (Form E/EA)? Help Center Home App How to include custom payroll items correctly in the year end forms (Form E/EA)? To ensure custom payroll items and their value are reflected correctly in the year end forms, you will need to choose the correct EA form field when creating custom payroll items. IMPORTANT: If you do not select a field prior to generating your year end forms, you may run the risk of under-declaring salaries (for additions) or over-declaring salaries (for deductions) and hence providing incorrect income statements to your employees and/or LHDN. For a detailed instruction on how to create custom payroll items, please read this help article. You find your custom payroll items under Settings > Payroll items. Choosing the correct EA form field will ensure that the amount of the custom payroll items are reflected correctly on the year end forms (Form E and Form EA). Note that all pre-set payroll items in our app are already set-up correctly. Feel free to consult our customer success team if you are unsure which category to choose for your custom payroll items.